Here is a short presentation of us and the goals for our breeding. Our goals are first and foremost to preserve the workingstock of the breed, we also believe this can be done without giving back on health or a good exterior so called "Dual Purpose Dogs". with "motor", i.e eager to work. Dogs that continues to work no matter what happens, is also very important to us and something we strive for and value very much. 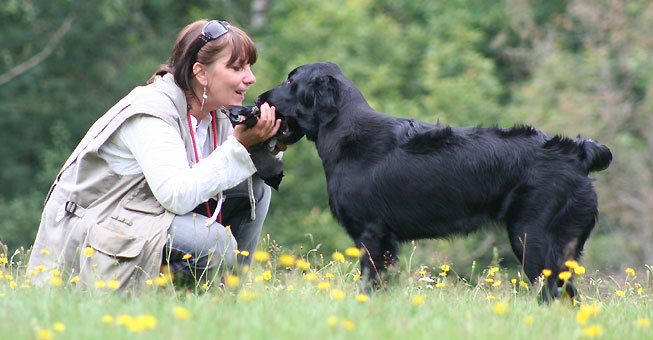 Far to many good workingdogs demands an experienced handler today - OUR goal is also to breed "easy-to-handle-dogs" that doesn´t need an experienced handler to become a good worker. Will-to-please is not the same as an obedient dog. Any dog can be made obedient but not all dogs have that full portion of natural inherited will-to-please. We always provide adequate help for every dog and owner and does not breed more than we handle to follow up..
"A retriever is a huntingdog for multiple use -NOT a companiondog that can be used for hunting." Both parents to our litters have ofcourse free hips and eyes clear and are merited in both field and show, and the combination should not be in the riskzone of inheritage deceases. We are proud to be able to provide adequate help and this is always included when buying a pup from us. This is something of a cornerstone of our Kennel. Our foundation - "Gillette, Nisse & William"
Youngest dog at the Norvegian FCR-Championship-08 and runner up Youngsters at the WT, totally placed no4 (show+wt) out of 43. Qualified for the field before 1 year of age and 1st prize at official test on the debut at 1,5 years and the debut in Open gave her a 2nd prize. She started only once in 2011 giving her a 1st prize in Open and the debut in Obedience gave her a 1st prize winning the class. Runner up in the Youngsterclass finals at the FCR Championships of 2007 with the same result as the winner and also as only dog in the finals with 20/20p and also two straight 1st prizes in Beginnersclass at cold game tests. The first start in Open also gave them a 1st prize. Now he has taken his second 1st prize in open qualifying for elite and also a 1 st prize in Elite. He was also runner up at the Championship in 2009 this time in Openclass winning the first round but lost a few points in the finals. in mind for all breeding. SUCh SJCh SVCh Rainstone Petit Nicoise. Our Prefix is Gilliam, from Gillette and William. who have proven to have inherited her fantastic working abilities. 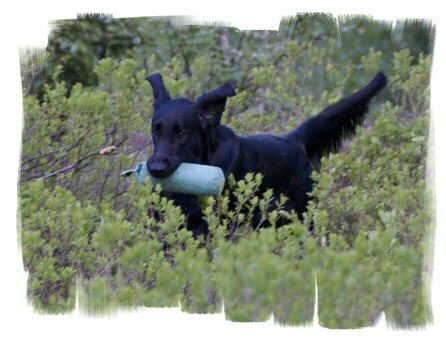 (see photos) a "FTCH" who has also become "Field-retriever of the Year" and an Obediencechampion who is also Trackchampion. 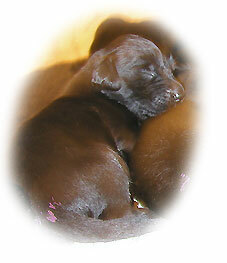 Several of the other dogs in this litter are highly merited both in field and obedience. From the litter´s 7 individuals - 5 of theese got, not less than 12x1st prizes at cold game tests from puppyage (under 2 yrs) - several of these 1st prizes with "honours" and "best-dog-awards". 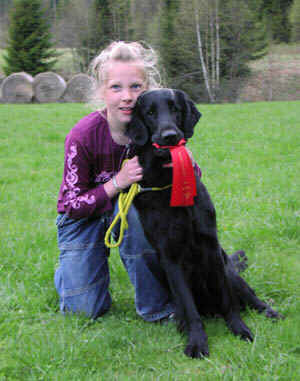 At 7 years of age they have toghether not less than 33x1st prizes with 14x Best-dog-awards at cold game tests. After 7 yrs one of the brothers continued to collect best-dog-awards and 1st prizes. who herself has proven to be a good worker with her very young handler Johanna. "Best free search" and "Best waterwork" at the Swedish FCRchampionship of 2003, in Youngsterclass and "Best Marking" at the Championships of 2004. This time in Openclass also as youngest dog of the class. At official tests she got 1st prize in Youngsterclass with best-dog-of-test-award and also 2x1st prize in Open, qualifying for Elite. She has several other field-merited syblings. 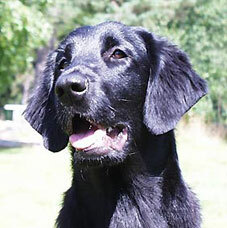 One of her brothers - G´s G Black Ammuntion - was runner up in the Openclass-finals at the Swedish FCRchampionship of 2006 among 84 dogs, and one of her sisters - MultiCh G´s G Black Russian was first retriever in Russia to qualify for "Grand Champion", which means she is a Multi Showchampion and has the International Field Trial Certificate. Her Int FTC she obtained with an "Excellent" on duck. Yes and her sister in Russia have also proven themselves as very good broadbitches. Several dogs from our 2nd litter are also bloodtrackingchampions, some are also merited obediencedogs with classwinnings and several dogs from the litter also have cc´s/cacibs and cc-qualityawards from shows. Viwi - "SVCH Gilliam´s Gold Once You Pop"
Nix - "Gilliam´s Gold Yes T Dej"
"Keno" - Flatterhaft Covergirl for Gilliam came to us as a lovely surprise. With her fine retrieverqualities we now have another line of excellent blood. 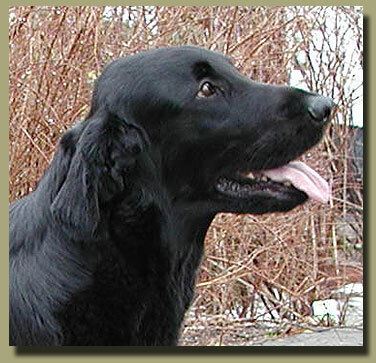 Both her mum and dad were excellent retrievers and has also been top quality broaddogs. This way they both have the points needed for the Kennelclub´s Breedaward. Keno has earned my respect 100% and I have got all the things in her that I expected from her parents. Springseason 2008 she proved herself at the only 2 cold game test we attended and took her 2x 1st prizes in Openclass qualifying for Elite. She also got 1st prize in Elite. 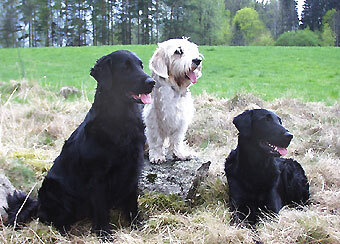 With theese dogs we now have offsprings from 2 of Sweden´s most merited and wellknown dogs of all times. 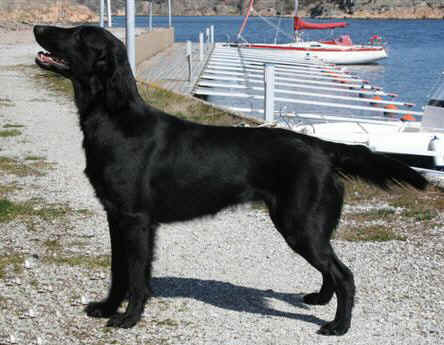 2012 we brought in 2 Flatcoats from the US and hopefully they will be our 3rd "leg" in the kennel - contributing with new bloodlines. The kennel was founded late 90´s, when we decided to mate Gillette at age 4. We had grown up with dogs and Karin had her own Beagle. The responsability for the breed and puppybuyers when being a breeder and to really critically look at the broaddogs is something we take very seriously. After less than a year owning and training Gillette we started looking for another dog as the interest for hunting grew. We took our huntersdiplomas and it didn´t take long before Nisse the Basset came into the household. Matilda Nowadays mostly Karin keeps the dogs busy. 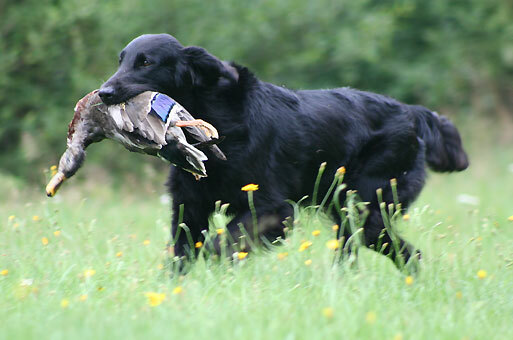 Our own dogs we use picking-up as much as we can during the season but we also try them and merit them at tests. Sometimes we also show them. Matilda - girl no 3 of the family was also a good handler once and she has helped with whelpings etc throughout the years. 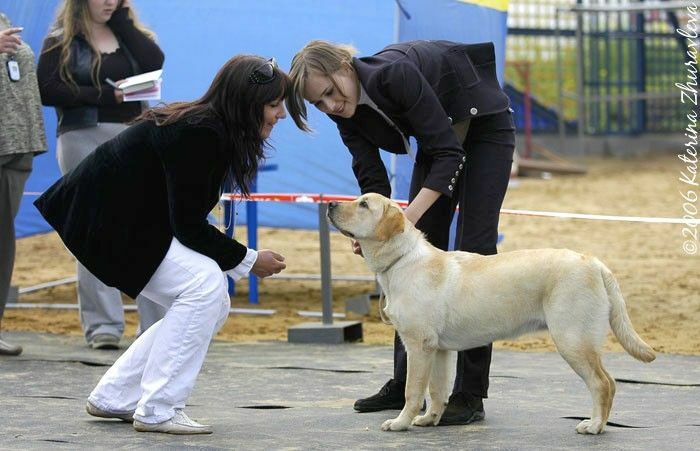 is now a co-owner in the kennel and has with her Yes - Gilliam´s Gold Black Addiction - made a name for herself as a handler despite of her young age. One could read about them in both the Swedish retriever- and spanielmagazine "Apportören" and the Finnish "Nuusku", before she turned 10. At her first Flatcoatedchampionship, not even 11 years old, she won the prestigeous prize - Cinnamon the Walking Stick - for Best Handler, with over 200 contestants, and got her name among many famous retrieverhandlers. Besides handling dogs in the field, she has also already made success as a showhandler. 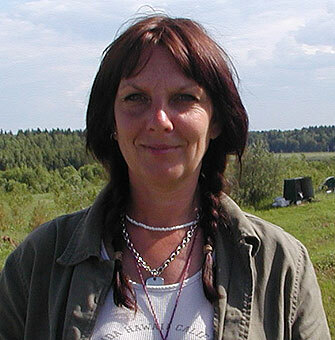 At the international show in Malmö 2004, she showed her young Yes to CC / CACIB and BOS. All this is good enough for making us very proud, but at her and Yes´first obediencecompetition, they also brought home a 1st prize and was placed 3/10. Now Johanna has a Petit Brabancon, one of the Belgian Griffons, and will be the one taking on the breeding of that breed. 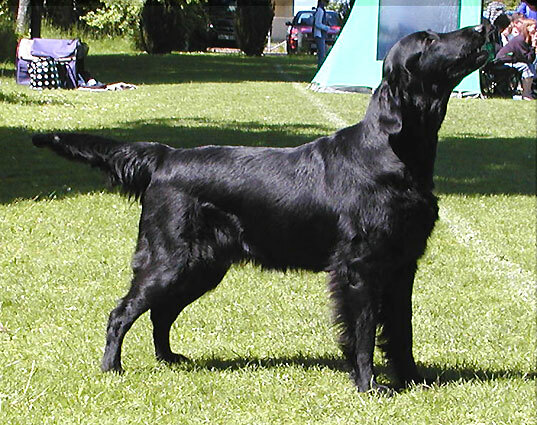 has been, and still are, involved in various dogclubs such as The Bassetclub, Petitclub, Spaniel- & Retrieverclub and Flatcoated retriever club. 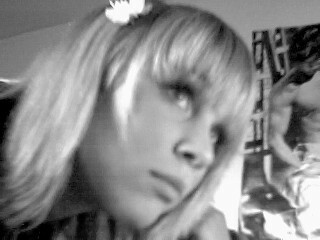 Both as a member of the clubboards, as "cold gametest-leader", as retrieverinstructor and as editor of clubnewspaper. Sweden, Finland, Norway and Russia. In my everyday job I have done such various things as business all over the world, working as Director of Merchandising & Marketing for a mailordercompany and worked as Veterinary Territory Manager for Hill´s Petfood.